The vote on the bill was deferred to Friday. Councilmember Menor pointed out that the changes to the draft were substantial enough to require 48 hour notice, and that it was necessary to be strict about this since the ordinance is sure to be challenged in court. To me, it seems odd to pass a law that is certain to be challenged in court where we (The People) have to bear cost of defense penalty for being unconstitutional. Why shouldn't the tourist corporations and businesses that paid the councilmembers to draft and pass this law bear those costs? Also, Friday's meeting will not hear public testimony. If the changes on the bill are substantial enough to require notice, shouldn't the public have an opportunity to comment on those changes? Why is the public being treated as casual obstacles? Prediction #1: Jun Yang speaks! Director of Housing Yang has not been allowed to speak at homeless criminalization hearings (or even appear in chamber) since the debacle of June 26, 2014. At that Honolulu Council Zoning Committee hearing, he and Office of Community Services Director Pam Witty-Oakland were grilled by committee members. 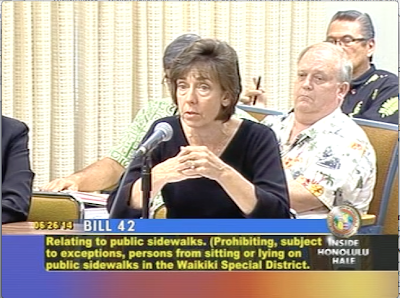 Most of the members were desperately seeking a way to pass through Bill 42 criminalizing sitting and lying on the sidewalk in Waikiki. Yang and Witty-Oakland, being appointed rather than elected, had major problems lying about a Housing First solution that didn't exist and in the end the committee had to defer the bill. Witty-Oakland "resigned" shortly thereafter and Mayor Caldwell must have banished Yang from appearing in Council, because he has been nowhere to be seen at the Council criminalization of homeless hearings since then. So why do I say Jun Yang will speak? The aforementioned Bill 42 eventually did pass. It took another hearing and Managing Director Ember Shinn (the one with the big silver Mercedes parked in front of Honolulu Hale) to announce to the Council that the City was just about to open a Housing First tent city at Sand Island. I mean, like, any day now! Over objections by Councilmembers Breene Harimoto and Kymberly Pine, the Council bought in and passed Bill 42 criminalizing sitting or lying on the sidewalk in Waikiki. But the Sand Island tent city hasn't happened, and probably won't ever happen. A cursory check of the records (and older folks memories) would have revealed the selected site was a toxic dump not habitable by people or other living things. The owners, the State, requires testing before signing off on the property, and that would raise costs to perhaps $1 million. But was there any real intent to put any kind of site on the property or was it just a prop to get Bill 42 passed? 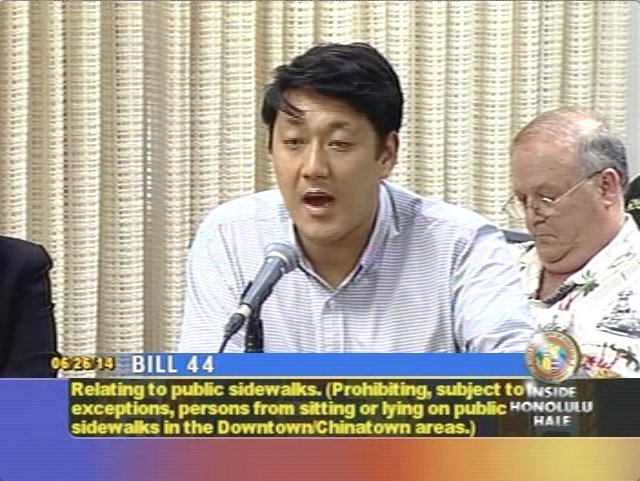 But here comes Bill 48 which extends criminalization of lying and sitting to other parts of Oahu where the homeless have been forced to find shelter. The Council again needs someone from the City to speak to the fact that thousands of homeless stand (okay sit) to be criminalized because there is no alternative to their being on the street. No problem. FACE, Faith Action Community Equity, a church based nonprofit, seems to have an answer. Guess what? FACE is having a housing summit on Saturday (Nov 15). "The event will open with a speech from Kirk Caldwell which will talk about the plan we have been working on with his staff." Question: Whoever could that be? 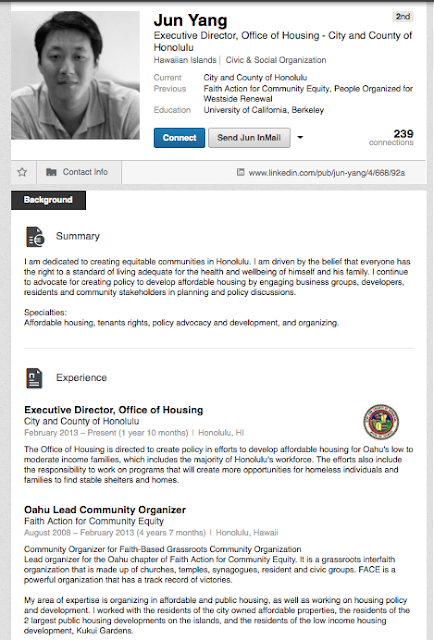 Answer: Jun Yang, who was the Oahu Lead Community Organizer for FACE directly before he was appointed to be Director of Housing for the City of Honolulu. Prediction #2: FACE gets huge City contract for their homeless housing "solution" which has been developed in partnership with their former Oahu Lead Community Organizer, Jun Yang. In true Honolulu good ole boy fashion, big bucks get delivered to or through the inside guy. All the Council needs to hear is that there is a housing plan for the homeless that will allow them to pass Bill 48. The Councilmembers interest in this is that it takes money to get elected and the money is on the "pass" side, not the Civil Rights side. Prediction #3: Like the abandoned Sand Island tent city, the FACE housing solution won't materialize. Or at the very least it won't come about in time to help those criminalized by Bill 48. But by then people will be eating Thanksgiving turkey (or Christmas Goose) while the homeless are being jailed. Prediction #4: The homeless will be forced into seeking shelter in malls and residential areas. Since Bill 48 (like Bill 42) won't do a thing about solving homelessness, it doesn't reduce the actual amount of homeless people who will then have to crowd into malls and residential areas. Prediction #5: Passage of Bill 48 will lead to the further criminalization of homeless by extending criminalization to the areas the homeless will be forced into. Prediction #6: The Final Solution: The City will propose that the poor and homeless be hauled away to prison camps. …But that's a post for another time. Anyway, those are my predictions. Let's see how I do. Oppose Bill 48 and the further criminalization of the poor!